In the early 1900s, Huntsville, Alabama, had more spindles than any other city in the South. Cotton fields and mills made the city a major competitor in the textile industry. Entire mill villages sprang up around the factories to house workers and their families. Many of these village buildings are now iconic community landmarks, such as the revitalized Lowe Mill arts facility and the Merrimack Mill Village Historic District. The "lintheads," a demeaning moniker villagers wore as a badge of honor, were hard workers. Their lives were fraught with hardships, from slavery and child labor to factory fires and shutdowns. They endured job-related injuries and illnesses, strikes and the Great Depression. 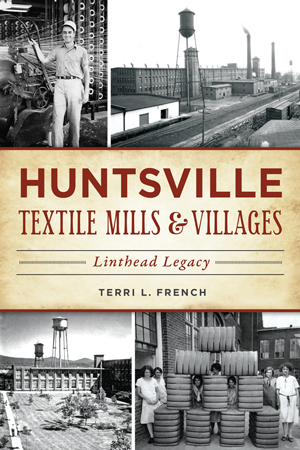 Author Terri L. French details the lives, history and legacy of the workers. Terri L. French is an award-winning poet and writer with an interest in regional culture and history. She has worked as a licensed massage therapist, freelance writer and editor. Terri has also served as southeast regional coordinator for the Haiku Society of America and secretary for the Alabama Writers Conclave. The native Michigander has lived in the Tennessee Valley since 1987. She and her husband, Ray, a NASA engineer, have four mostly grown children, a spoiled dog and two rotten cats.